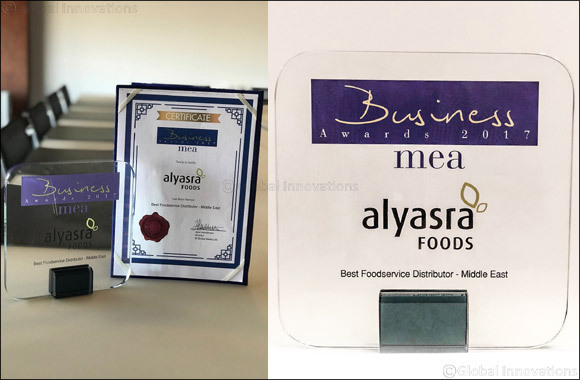 KUWAIT, 12 April 2018: Leading food and beverage distributor Alyasra Foods has been awarded the Best Foodservice Distributor in the Middle East at the MEA Markets Business Awards 2017. Alyasra Foods, a trusted name in the FMCG and foodservice industry since its formation in 1989, saw off some stiff competition from around the region for the prestigious award. Alyasra was honored for its commitment to providing the best quality food and services, and unrivalled industry excellence to thousands of homes, hotels, businesses and retail outlets across Kuwait, Iraq and Saudi Arabia. MEA Markets Awards recognize and give exposure to firms in this vibrant business region that are committed to excellence across all areas, for themselves and their clients, shaping their industries and the global corporate community in the process. Alyasra Foods has achieved international standards, namely the ISO 22000:2005 certification for food quality and safety in receiving, storing and delivering goods and services the interests of all its stakeholders as one of the largest suppliers to the region’s HORECA, Foodservice and retail sectors. “Everyone at Alyasra Foods is committed to the highest standards, from senior management, right through the team. This prestigious award from MEA Markets is a reflection of that and a tribute to the hard work of all involved,” said Niels Frandsen, Chief Executive Officer of Alyasra Foods. “Our mission is to deliver services perfectly, making life easier for them, allowing them to focus on growth and development. We are committed to fostering and strengthening strong relationships with our clients and across our entire staff. That is what makes us unique.” He added.